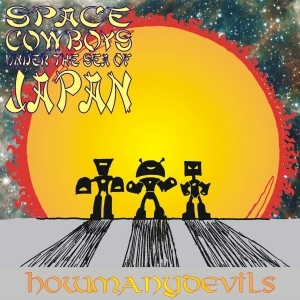 This entry was posted in Space Cowboys Under The Sea Of Japan and tagged Album, HMD, HowManyDevils, industrial, Joy Division, Music, Rachael, Rock, SCUTSOJ, Space Cowboys Under The Sea Of Japan, synth, The Cure, The Noise. Bookmark the permalink. Not really verse chorus here, just the same line repeated until the end but with several different twists on how it is actually played. I was a little surprised when Pete said it sounded like The Cure because I wrote it while I was watching the Joy Division documentary. It is a bit of a walky bassline though, no Peter Hook-ness to it. I think it has my sole lyrical contribution to this album, I’m not sure what I was writing about. The Noise really refers to the dodgy guitar wiring buzzes that I used as percussion on the demo (the demo just built up in to the final song here, and I’m considering industrial music because of that bit of percussion!). I don’t know who Rachael is. My next door neighbour is called Rachael and they had only recently moved in so it may be that I’d just heard the name recently. Or it could have been something on telly. The second part of the song was all jammed out straight to Logic again like Simon says. My part is again untouched, Simon and Pete’s parts got chopped and shuffled so that we were all building and dropping in similar places. I do think the synth, which was Simon operating Logic through my hands, really drives that section.